Waterproof: you can go diving with it up 15m. Crushproof: you can throw it around and literally jump onto it. Nikon is releasing the CoolPix S800C in September. With the Android and WiFi powered, you will be able to use your favourite application (Whatsapp, Facebook, Ubuntu One, DropBox, etc.) to share photos easily. Here is the cool features of the CoolPix. 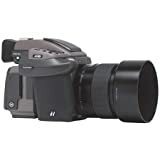 Ever since Panasonic started offering their first micro four-third, interchangeable lens cameras, they have been rolling out models with lots of features. They call this the Lumix G Micro-System. The Panasonic Lumix DMC-GH2 is the latest in the family, its got more advance video capabilities than the G2, whcih is primarily for still photography. Advantages over its predessor GH1. 16 Megapixel vs 12 Megapixel. The actual sensor is 18 Megapixel but gives you 16 Megapixel in different aspect ratios. And yes the camera can shoot in 3D with 3D Interchangeable lens. Panasonic claim to fame is this model has the fastest auto-focus. The Canon Photoshot G12 is targeted as a backup camera to professional gear like DSLRs. These have a lot of features found in professional cameras in a compact form factor. My suggestions: If you don’t need the additional features, go with the G11 as you may get a nice deal. Canon has announced the SX30 at Photokina 2010. This is new addition to the super zoom family. Earlier Canon was still limited to 20X while competition had gone to 30X. With this release canon has now beaten most of the competition by releasing a 35X Optical Zoom. Here are some cool features. I have used over a dozen bags from LowePro, Case Logic, Samsonite, Belkin, Hush Puppies to name a few known brands. I have also evaluated Targus, Swiss Gear and some other brands in detail. I have founds that a few are well designed to carry laptops while others are well designed as professional camera bags. I have come across very few bags which are well suited for both. As a matter of fact most IT professionals, specially the young ones are buying Digital Camera. After the laptop their next purchase is usually an expensive gadgets (iPhone/iPad) or high end cameras. Remember bag is no more an accessory to carry your device, it provides security to the customer that all his/her devices are going to be safe in this bag. For me, my bag is my office while I am travelling. I use the bag to carry a laptop, sometimes a second laptop/netbook for demos. Brochures, Business Cards and CDs. I also carry a camera with a lens and other accessories. Stroller backpack: Strollers are good to use when you have lots of stuff to carry around and don’t want to strain your back. The challenge is to make the bag light weight at the same time able to have a stroller. Solution: Explore alternative material like titanium/carbon fiber for stroller. All terrain stroller wheels: The stroller wheels should be big ones which can work in difficult terrains. I have used bags, where the stroller is designed only to be used in offices/hotels and not designed for outdoor use. You may not always have a smooth train specially if you go outdoor for photography. I am currently using a bag which has silicon wheels, lets see how that goes. Weight Bearing Capacity: Some of the bags that I have used, give way once you put all your things. Most of the bags don’t publish their weight bearing capacity so you don’t know how much you should or should not load. Solution:Publish the Weight Bearing Capacity. Solar Panel: I saw some bags which had solar panels on the top, these are nice for emergency charging of cellphones and other devices. They are also environmental friendly. Laptop Slot: Since the bag is primarily going to be used to carry a laptop, the slot must be well padded from all sides include the base. It should also not directly face the stroller metal bar as this could damage the laptop. Impact resistant base: The base should be designed to be able to take a small amount of impact/drop from a desk in case that happens. Mobile phone/mp3 player slot: Many people user their mobile phone as an Mp3 player, the bag should have a slot to put these. This should be easy to drop it as air travellers need to quickly drop their mobile phones at airport security. Removable Laptop Sleeve: The bag should have a laptop sleeve, so people can remove the laptop from the bag and yet have some protection. This is useful for airport security or if customer just want to take the laptop with him/her without taking the entire bag. iPad Compartment: Many customer already have a second device (Netbook) or will invest in a iPad like device. The bag must have a compartment for a second device such as a second laptop which is required for demos, second netbook or an iPad. Removable laptop battery case: in one of the bags that I used, it has a little case for laptop battery which was removable. This is a nice feature and can have Velcro to strap it inside the bag. Removable Camera Compartment: There should be a compartment to carry a digital camera with some accessories or an SLR. This should be removable so customer doesn’t have to carry multiple bags when he/she wants to keep the bag but move around with the camera. Adjustable pockets for accessories: Many people need to carry additional accessories/lenses, etc. The bag should have a pockets which should be adjustable to carry one big device or a few small ones. Water bottle/drink slot: A few bags have them, while others don’t. While travelling people want to carry water or their favourite drinks. Key ring hook: A key ring hook is a nice feature, so people can secure the keys inside the bag. A few bags have them, however a few of them have key-chains inside, which one needs to use to use the hook. Its better to just provide a key hook so people can use what ever key-chain they want to use. Secure compartment: Bags usually have a place to store your passports/cash but they need to be secure enough so people trust them and use them to keep their cash and other important document. Slots for Brochures, pens, business cards are given and found in most bags. Phone Slot: People still prefer to keep their phones in their pocket, but at times they need to keep their phones away like at Airport Security. They bag should have slot where they can keep their phone away at the same time have easy access. Sleeve for Luggage: Some bags have a sleeve which can be used to attach your laptop bag to the luggage, this makes it easy if you have to carry two bags. Not just black! I have see so many nice bags, but all that they have is a black colour. I know black is the corporate colour and many business laptops are black too but its time to experiment with more colours. I must now like to admit, that after writing this article I came across Crumpler bags. They were able to satisfy most of the requested features but not all. I will write my review once I check them out. Canon has released the 550D as an upgrade to 500D. It has inherited some of the features of their high end 7D while offering a cheaper alternative to 7D. 18 Megapixel! Will this megapixel race ever end? If faster burst speed or weather proofing is not your requirements, 550D would work out better for you. Panasonic is expanding their micro-four third lines by introducing two new cameras. People often send large photos via email. These file sizes are usually large, typically a few megabytes because they are taken from multi-megapixel camera. The more the megapixel, the larger the file size. I prefer to reduce the image size before I email or post on the web, these file sizes are small (couple of 100 kilobytes) and typically occupy 10 percent the disk space of those taken directly from your digital camera. They are also easier to send/forward and you can send many of them at once. I found a very nifty plugin for Nautilus called Nautilus image converter. Nautilus is the default file manager on Gnome (Linux/Unix Window Manager). 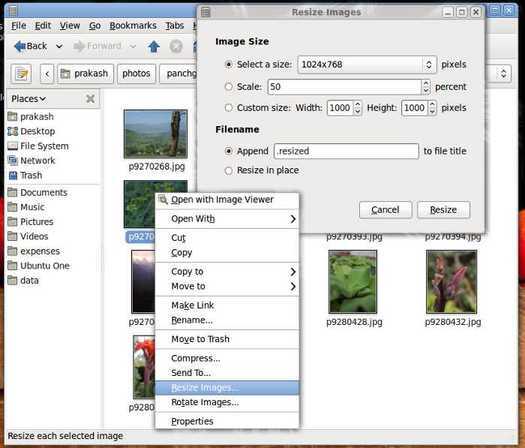 Under Ubuntu, startup synaptic and look for nautilus-image-converter. After installation, you need to either logout or re-start your PC for it to take effect. You can also replace your original image if you like and rotate them. For those who prefer command line, you can install this package called imagemagick and use this tool called mogrify. If your work required very high megapixel camera, this is for you. And yes it costs an arm and a leg – 25,000 dollars! Check out more. Olympus has been bringing Micro Four-Third cameras to the market faster that expected. After the E-P1 and E-P2, they have now released E-PL1 which is cheaper by US$ 200. Detailed comparison of all the three models at DP Review. Olympus has launched the E-P2 soon after they launched the E-P1. E-P2 has an electronic view finder which was absent in the E-P1. Rest of the specs remain more or less the same as the E-p1. With this tool, you can enable advance features in any Canon Camera. Supports advance features such as RAW support, additional to jpeg. This makes it easy to change white balance and other settings. You can write your own scripts or use ready scripts for motion detection and other features. Live Histogram capabilities allows you manage exposure correctly. Completely open source and GPL. And yes many other features. My earlier post on this. See some really cool sample images created using this. Lightning captured using motion sensing. Nikon has released P90, which is a prosumer camera, featuring functions found in professional cameras. This is a good alternative if you need more than a point-and-shoot but are not yet ready for an SLR. Many people buy an SLR and then they continue to shoot in auto mode because they don’t know how to use the other features. Or once they start using those features, they don’t have the means to buy all the lenses. A very good alternative is the Nikon P90, which has several features found in an SLR with the only limitation that you can’t change the lens. The need of which may not arise as the lens included is quite versatile. Face detection and Smile mode, automatically releases the shutter when the person smiles. Blink warning, warns you if the person has blinked. After all the megapixel race where camera manufacturers were increasing megapixels with each new model, Canon is the first to reduce 14.7 megapixel to 10 megapixel. I have been saying this all this while, that megapixels don’t matter any more and I am happy that Canon is doing the right thing. When Canon came up with a new model of G11 which replaces the G10, they decided to reduce the megapixel and improve the image quality. What they found was that while increasing megapixels was making the customer feel that they are getting something better, it wasn’t adding any much value other than increasing the file sizes. In fact it was generating more noise at higher ISOs, resulting in poor photo quality. Here are some key features of G11, which is a professional quality point-and-shoot. Designed to be as a backup camera for professionals. Looks like a good option of you need better photo quality and features, want to move up from a point-and-shoot and are not yet ready for an SLR. Prakash Advani's Blog is powered by	WordPress 4.9.10 and delivered to you in 2.545 seconds using 220 queries.